A few people have asked me what my desk looks like, specifically in regards to how I mentioned I have a bunch of archive stuff on my walls. 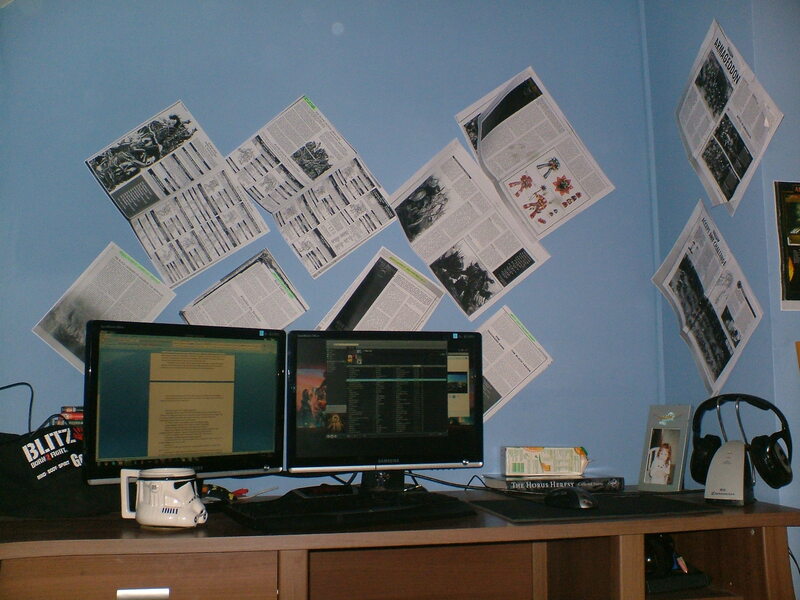 To sate that minor curiosity, here’s my desk and one of those walls. This is about 1/4 of the archive stuff I use as hideous, geeky wallpaper. Yes, yesterday it was a WoW desktop background. It is currently a Judge Dredd one. As you can see, the Blood Reaver document that’s open is being edited, rather than added to. That’s why the novel is so late, and something I’m trying to fix today while I can still remain awake, fuelled by coffee and panic. Now, if you’ll excuse me, I have to do an insane amount of work. Like a big boy.